A disparate collection of cultural, historical and geographical features including 59 miles of the Pacific coastline make up the Golden Gate National Recreation Area, an urban park that attracts up to 17 million annual visitors. The Golden Gate is the mile wide passage between the turbulent Pacific Ocean and the calm, sheltered waters of San Francisco Bay, bordered by the Marin Peninsula in the north and San Francisco in the south, and crossed by the most universally recognized symbol of the city, the Golden Gate Bridge. The bridge itself is not part of the NRA though many of the best vantage points are, along the shore at either end. On the south side of the passage, protected sites include beaches, coastal bluffs, forts and other military installations, historic buildings, Alcatraz Island, the Presidio and San Francisco National Cemetery. 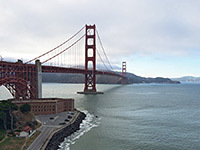 In contrast to the densely populated city, the north side of the Golden Gate is still largely in a natural state, apart from a corridor of development along Highway 101. 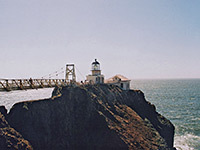 The hilly Marin Peninsula is bounded by occasional sheltered beaches between long sections of rocky cliffs, and forms by far the largest portion of the National Recreation Area, though here too are found several military sites, plus a working lighthouse. 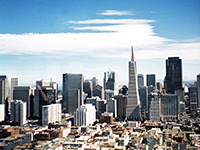 Accommodation is available in San Francisco to the south, or Larkspur, Corte Madera and Mill Valley to the north - follow the links for hotel descriptions and photographs. climbs into the hills and passes various high viewpoints of the bay, the ocean and the city - a scene often obscured by fog, especially in the morning. The first site of interest is Battery Spencer, once home to several large artillery pieces that helped defend the Golden Gate between 1898 and 1943; today various concrete buildings and metal foundations remain. 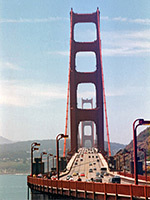 The battery is also one of the most popular locations for photographing the bridge. Nearby, an unpaved track leads to Kirby Cove, location of a sea-side, walk-in campsite, open by advance reservation only (2018 fees $25 per night). After a mile the main road becomes one-way (westwards) and for cars only, though an alternative route branches inland, descends a valley to a junction with an alternative approach from Sausalito, and ends at a parking area by the ocean at Rodeo Beach, a half mile long mixture of sand and stones. 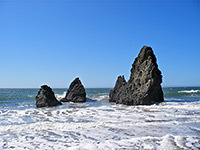 The beach slopes quite steeply down to the ocean, buffeted by large waves that make this a popular surfing location, and bordered by scenic rocks at the south end. Just inland from the beach is the marshy water of Rodeo Lagoon, near which are two army forts (Cronkhite and Barry); together with Fort Baker on the east side of the headlands these saw active service during both world wars but are now used by a variety of educational and environmental organizations. The Marin Headlands Visitor Center operates from the former chapel of Fort Barry, from where a short side road leads to several more disused batteries, a cold-war era Nike missile site, and the start of a half mile trail to Point Bonita Lighthouse, right at the far south end of the peninsula. The path follows the east side of the coast, through a tunnel and over a rusty footbridge (maximum of 2 people), to the still-working lighthouse that is open for visitors on Saturday, Sunday and Monday afternoons only. This has a particularly wind-swept location, 100 feet above the fierce, crashing waves of the ocean, and it affords excellent views of San Francisco and the Golden Gate. Apart from two other roads (Highway 1 and the Tennessee Valley Road) along the north edge of the Headlands, most of the remainder of the area is crossed only by various footpaths. Several other sandy beaches are accessible, though most of the routes are inland, over bushy hills, ridges and valleys. The paths also reach three primitive campsites. 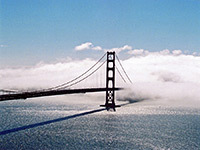 Further north, the protected land includes other sections of the coast at Muir Beach, Stinson Beach and Tomales Bay, part of the San Andreas Fault Zone at Bolinas Ridge (adjacent to Point Reyes National Seashore), and Muir Woods National Monument, which although administered separately is still a considered part of the Golden Gate NRA. In and around San Francisco, units of the Golden Gate National Recreation Area range from Alcatraz Island 30 miles south to a redwood forest at Phleger Estate, near Redwood City in San Mateo County. Alcatraz, site of the famous maximum security federal prison (in operation from 1934 to 1963), may be visited on privately-operated boat tours departing ten times a day from Pier 33 at Fishermans Wharf. In summer these are so popular that all may be booked up a week or more in advance. West of the Wharf, most of the next 12 miles of the coast is part of the NRA starting with San Francisco Maritime State Historical Park, which has a museum, library and several preserved ships of historical importance. Nearby Fort Mason covers a small area of hilly land by the waterfront and includes the main Golden Gate headquarters, various old army buildings, and several converted warehouses now used as galleries and art workshops. A little way further west is the Presidio, a large park, National Historic Landmark and former military base, that contains many more historic structures, spread out over wooded hills or along the coast. The west side of the Presidio is formed by the mile long sands of Baker Beach, one of the best places for views of the Golden Gate Bridge and the Marin Headlands. After here the coast bends westwards, past the smaller China Beach, to an isolated peninsula known as Lands End, the very western tip of the San Francisco Peninsula, where wind-blown cypress and fir trees cling to rocky hillsides above the raging sea. To the south, the rocks are replaced by more sand, as the straight, narrow Ocean Beach stretches for 3 miles, as far as the final NPS site (Fort Funston). This fort has a few military relics but is mostly renowned for its beaches, dunes and bluffs, which combined with the prevailing strong wind make this one of the top places in the US for hang-gliding.